Being connected in hospital can make the world of difference. For a number of years Dundee Library and Information Services has been enabling those people who are at risk of becoming digitally excluded get online. I was really impressed by colleagues who introduced a new initiative to distribute digital devices, such as iPads, into the community through a very successful loan scheme. However, it wasn’t until our young son was diagnosed with Acute Lymphoblastic Leukaemia in April 2011 and he had to spend large amounts of time in Ward 29 at Ninewells Hospital in Dundee that I realised just how important it was to be digitally connected to the outside world. Fortunately for our family, some of these devices were and still are on loan to the Children’s Oncology team at Ward 29 and these are used in a number of creative ways by NHS staff to help with the treatment of patients under their care. 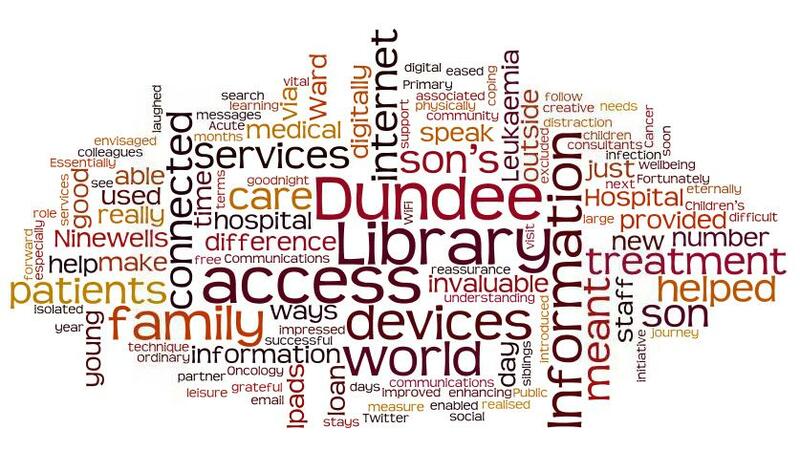 Originally, it was envisaged that the devices would help patients access Dundee Library & Information Services when they couldn’t physically get to a Library. This has been very useful in reaching those who can’t access services. The flexibility of the iPads and associated apps has also meant that they have also been used for learning, leisure and resourcefully as a distraction technique with children during difficult medical procedures. For us as a family though, what helped us most was allowing these devices to be connected to the internet by Wi-Fi provided by the local charity Tayside Children with Cancer and Leukaemia. This provided a communications lifeline to us that proved invaluable. The majority of time our young son was in hospital my partner stayed with him and being able to stay in contact was invaluable. This was especially so during the winter months when his siblings couldn’t visit the ward in order to keep down infection rates. Being able to speak via Skype meant that we could all at least see each other, share our days – good and bad. We laughed, we cried, did homework, said goodnight and even threw in the odd argument for good measure. Essentially, we were enabled to carry on in ordinary ways in an extraordinary situation. Internet access also allowed us to pass messages and vital information back and forth and speak to the extended family via email or social media. It meant we could search medical terms that we were unsure of and research questions we might want to ask his consultants the next day. This all helped so much in enhancing our understanding of our son’s care needs and also helped stave off feelings that we were somehow isolated from the outside world. We had the reassurance that there was information at our fingertips and knew that our family support network was just a click away. I know we were very fortunate to receive the high standard of care that we did and I will be eternally grateful to all those staff at Ninewells Hospital who eased our son’s journey. I also have no doubt that internet access during his stays in hospital improved my son’s sense of wellbeing during treatment and contributed greatly to us coping as a family unit. I also look forward to the day when all NHS patients and their families have free access to internet as it really does make the world of difference. Kevin is a Library & Information Worker and is soon to take up a new role as Communications and Public Relations Officer for Leisure & Culture Dundee. Kevin’s son is now nearing the end of treatment and is enjoying his second year at Primary School. You can follow Kevin on Twitter @kevinmcginley16 and Dundee Library & Information Services @dundeelibraries. This entry was posted in Uncategorized and tagged cancer, children, communication, digital, dundee, family, health, hospital, iPad, library. Bookmark the permalink. Thanks for posting. Im always interested in ways that services develop to improve the journey for people using healthcare but there is still a very long way to go re the whole IT development. I think things have moved on a fair bit tho and recall a few years ago that what you describe would have been unimaginable. IT is a huge part of everyones life these days and Im sure the thought of being away from the internet for even a day would be intolerable for most people. I wonder if there are any further developments in the pipeline?